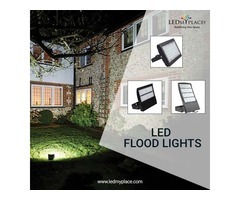 Today the lighting market is flooded with numerous LED lights that come in various different shapes and sizes, giving the buyers a feasibility to choose from various different designs. One among many LED lights is the standard sized 8ft LED tube that is mostly used at the commercial or residential places. This single ended tube has the ability to emit more lumen output then the normal florescent tubes. The heat dissipating mechanism of this 8ft LED tubes keep the tube remain cooler even if used for longer period of time as well . Start these tubes instantly with no flickering or humming which otherwise is much higher in fluorescent tubes. Also, the lumen output of this 8ft LED tubes is more than 6000 with energy consumption of 48w. Also the color temperature is 6500K, you can use these single pin LED tubes for at least 50,000 hours. 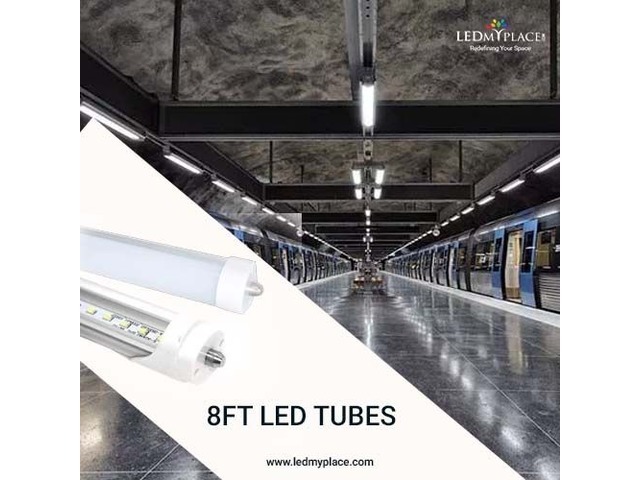 The base types of these tubes come is Rotatable R17D (HO) to retrofit the existing fluorescent fixtures, you can fix these 8ft LED tubes by just bypassing the ballast and making a direct wiring with the line source. Get 30 days return policy in addition to 5 years of warranty from the manufacture’s end. 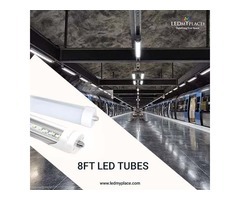 So replace those 120W of fluorescent tube with these eco-smart 8ft LED tubes and reduce the monthly utility bills by more than 75% which is definitely a significant amount to consider.